Do you like working on your shop more than making things that come out of your shop? 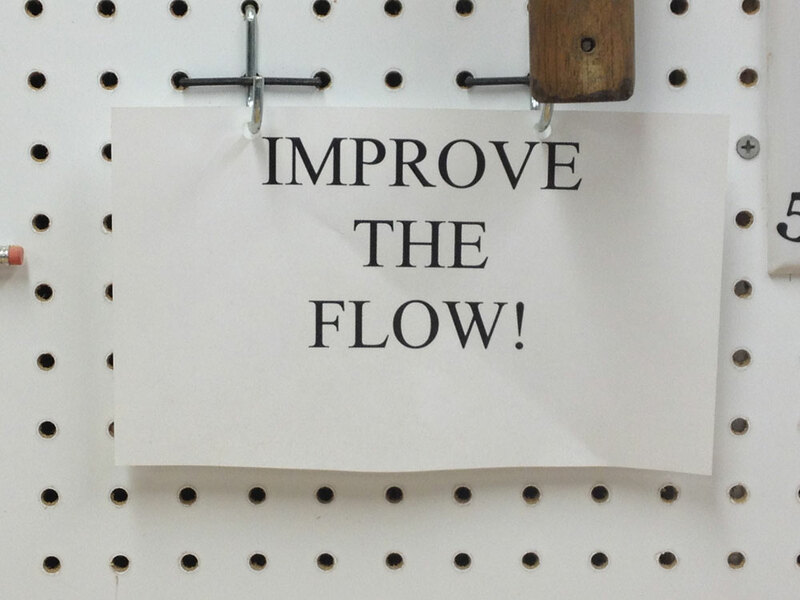 Whether you call it “making shop furniture” or building cabinets for the shop, do you enjoy simply improving your shop? To me, there’s something special in making the workspace better. 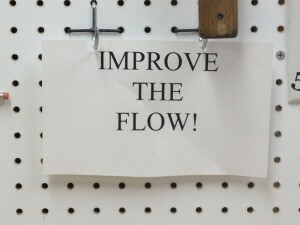 To constantly remind me to make the shop better, I have several iterations of this sign. Of course, I think we all enjoy buying a new tool. To me, “new tools” and “improving the shop” fall in the same category. Sometimes the two coincide. After Katrina flooded the lower level of our home, I bought some really inexpensive tools that I knew I would replace when I found exactly what I wanted. I’d never had what I considered to be a good jig saw and, since I didn’t know which one I wanted, I just bought the bottom-level Skil. 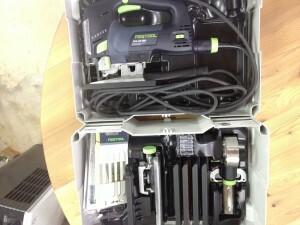 A few years ago I got the Festool bug, purchased several tools, and decided I’d get a Festool Jig Saw. I’d watched some videos of people using and talking about them and they were all ecstatic. 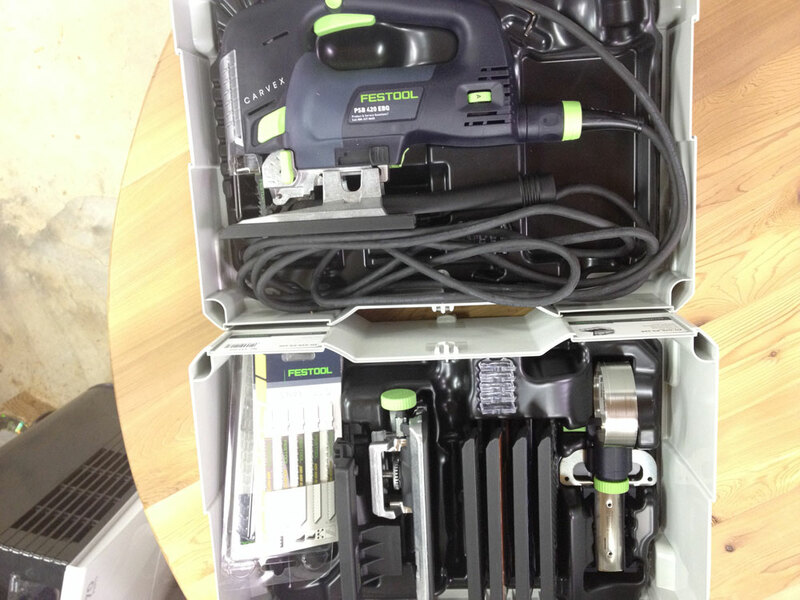 However, I’d had a couple of conversations with Steven Johnson about his Festool jig saw and he said he liked his Bosch better, and he wanted to sell his old Festool. That left me thinking that I still wanted a Festool jig saw, so I didn’t buy a Bosch or a Festool, I just limped along with the little Skil. After all, I didn’t need a jig saw very often. I kept meaning to look at the Bosch at the home center, but I kept forgetting. Several weeks ago the jig saw itch came back and I asked Steve if he was still happy with his Bosch. If he was, I was going to at least look at it, and possibly buy one. I placed my order on Thursday and the Highland Woodworking shipping department wizards (thanks, Alexandra!) had FedEx boxes to me by Monday afternoon. I dedicated the new CT36 to the Kapex and tucked it out of the way under the bench. Because I’d also ordered the accessory kit for the Carvex, I had not one, but two new Systainers. Here’s the new Carvex with the accessory kit. If you can swing it, either at the same time or later, the kit includes some must-haves that are much cheaper when purchased as this set. I had already found myself to be annoyed by Systainers, as they were big, I didn’t have a dedicated place for them, and when stacked up on the workbench they were eating valuable real estate. While the Rotex and ETS sanders were in use, their Systainers were consuming space on the bench. They had to go! I’d seen other woodworkers design elaborate storage systems for their Systainers but they took up wall space or floor space or both and I wasn’t willing to sacrifice either. The following Saturday morning I woke up at 3:30 AM and no matter how hard I tried to go back to sleep, my mind went back to Systainer storage. “In the ceiling space,” a loud voice kept repeating. I was already using ceiling space for scrap wood storage, but there was plenty of space left. For wood cutoffs I had created this system, which depended on the pieces sitting on narrow strips of wood. That still works well for wood scraps, but it was obvious the strips would move when inserting and removing a Systainer, especially with the weight of the tool inside. 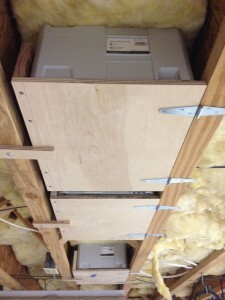 This system in the ceiling of our garage works great for scrap wood storage. I wanted to put Systainers here, too, but needed an immovable support. More “noodling” required, as Steven Johnson would say. The mind is an amazing thing, and neither medical nor psychological science has been able to illuminate more than the surface of its secrets. Between my 3:30 AM wake-up and my 5 AM get-up, I had a fully-designed, hinged system for the Systainers that I call “hatches.” Brenda and I are big fans of the 2004-2010 television drama Lost. 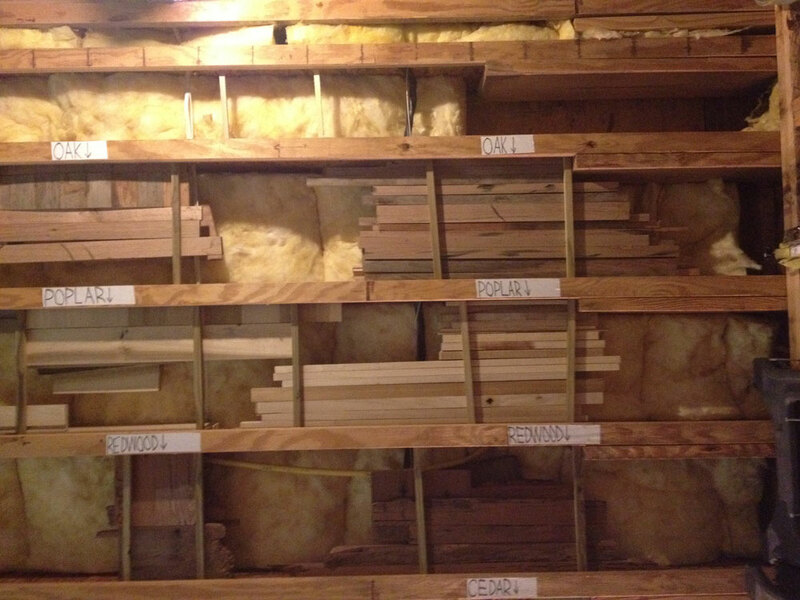 Thoroughly obsessed with “improving the shop,” a week later I’ve left work early three evenings, I have “hatches” for all of the Systainers, and I’m trying to figure out where to put hatches for the DeWalt drills, the biscuit jointer I almost never use, and a few other small tools. 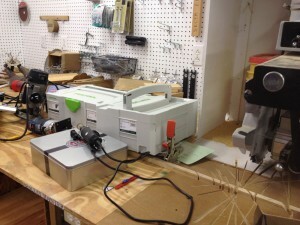 Here are the Domino, Rotex and ETS Sander Systainers tucked away until they’re needed. The sanders are used so much that their Systainers will probably stay empty. The Domino can quickly be pulled out when it’s needed, and put away when it’s not. The Carvex and its accessory kit’s hatches are in another location.